College coaches across the country continue to scour the basketball landscape from coast to coast in search of interior prospects in the 2019 class in hopes of finding a late blooming prospect that can help bolster their recruiting haul this fall. The state of Wisconsin is no exception to looking under every rock and David Skogman of Waukesha West High School is the reason why. Equipped with a 6-10 200 pound plus frame, forward Skogman definitely passes the look test for Division 1 post prospects and his character and ability to be coached checks those boxes as well in a positive way. However, it doesn’t just stop with Skogman on the physical or off the court tools as his ability to impact the game in a variety of ways is equally impressive. Offensively he has nice hands and his ability to catch and finish around the basket with either hand is efficient and consistent already. He has a nice feel for the game instinctively as well and that allows him to finish at each level whether it’s spotting up from beyond the arc, scoring off a pick and roll around the basket, or simply knocking down a 15 foot jumper from various angles on the court. More of a face up scoring talent at this stage Skogman has shown a unique ability and advanced footwork to score with his back to the basket on occasion whether it be with a straight up post move or simply using leverage, angles, or a variety of fakes to manipulate opposing bigs and score. Athletically Skogman is impressive as well as he’s shown a consistent ability to run the floor and elevate as needed to finish above the rim where he does so both in transition and with solid catch and finish ability in half court sets. That same athleticism also helps him defensively as he combines that with his instincts and agility to alter and/or block shots as well as make things difficult for opposing bigs by being in position consistently to challenge their scoring opportunities defensively. 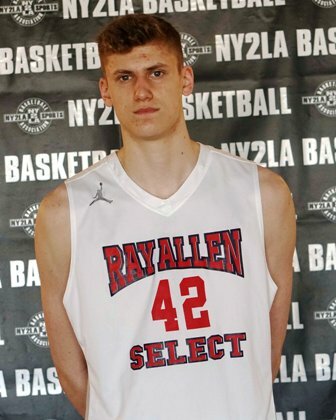 The talented big was stellar at times this past spring during the NY2LA Basketball Association campaign and that play combined with his continued development thereafter has seen Skogman’s recruiting trail pick up substantially and he’s quietly become one of the more coveted interior prospects in the 2019 class regionally. UC-Davis, Southern Illinois, Valparaiso, Elon, North Dakota, Canisius, Sam Houston State, Rice, Air Force, UW-Green Bay, LIU-Brooklyn, Furman, Lafayette, American, Bucknell, and UW-Milwaukee currently have offers out to Skogman. Fundamentally advanced at this stage and obviously checking a lot of boxes physically, Skogman continues to intrigue college coaches of all sectors. Kansas State Head Coach Bruce Weber checked in on Skogman last week, Boston College was in yesterday, and Boise State is expected in the gym later this week to watch him as well. Still far from a finished product Skogman is one of those late blooming prospects with talent who continues to build momentum in a 2019 class thirsty for prospects that have size and skill for the next level. He played with the Ray Allen Select program during the grassroots travel season.